Day 1: Transfer from Marrakech to Dades Gorge (350 km) After breakfast, travel south towards Ouarzazate (gateway to the desert). Firstly, we will cross the spectacular Tizi n’Tichka Pass of the High Atlas mountains. We will venture through many Berber villages, heading into the desert, where you can admire riverside oasis and barren hillsides clustered with Kasbahs. Enroute you will stop at the ancient fortified city of Ait Benhaddou used as the backdrop for many films include Gladiator and Game of Thrones. After lunch, we travel further into the Valley of the Roses, with stunning views of the Dades valley. This is in the heart of rose growing country. Damask roses were first planted by French settlers, and are harvested to produce an essential oil, used in « Eau de Rose ». See the roses at their best in May.Overnight in the Hotel in Dades Valley . Day 2: From Dades Gorge to Merzouga stopping at Todra gorge and the palmerie at Tinghir. On arrival at Merzouga at the dunes of Erg Chebbi, you will ride camels into the dunes, where you will spend the night in berber tents. After seeing a beautiful sunset you will enjoy a fantastic dinner. Overnight in Berber camp. Under clear skies you will see a stellar spectacle. Day 3: Awake to a magnificient sunrise. 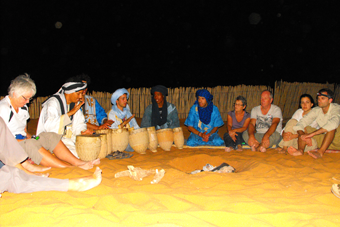 Take the camel trek back to Merzouga. 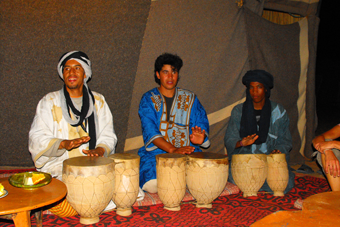 Transfer to Zagora in the Draa Valley, overnight in Hotel. Day 4: Transfer from Zagora back to Marrakech. From there it will be a long day driving back to Marrakech, again via Tichka pass. Day 1: Early morning departure from Marrakech by our car to the desert. 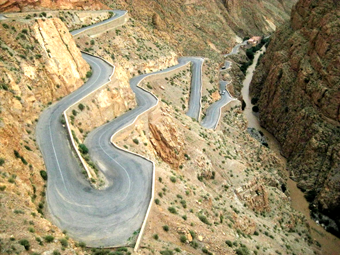 Cross the spectacular Tizi n’Tichka Pass (2260m) of the High Atlas mountains. Along the way pass through Berber villages, and once in the desert, riverside oasis and barren hillsides are clustered with Kasbahs. After lunch we drive further to Valley of the Roses, with beautiful views of the Dades valley, valley of a thousand kasbahs. Overnight in Dades. Day 2: After breakfast we drive to Todra Gorge and after a short stop, we drive on to Merzouga at the dunes of Erg Chebbi. We will arrive there around 4 and after a short break you will ride camels into the dunes, where you will spend the night in berber tents. After seeing a beautiful sunset you will enjoy a fantastic dinner. Day 3: After viewing the fabulous sunrise and after breakfast at the camp site, you will ride the camels back to the Merzoga. From there it will be a long day driving back to Marrakech, again via Tichka pass.